Last weekend, I realized once again how important it is to always tell the truth. And to teach our kids to do the same. The trouble began on Saturday morning. 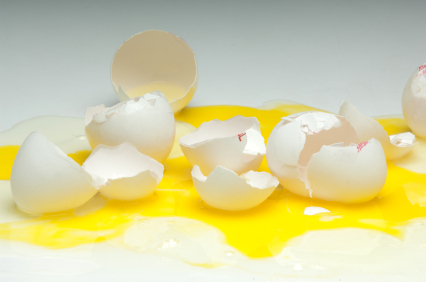 I put a dozen eggs on the counter and when I emerged from the bathroom, a dozen eggs were smashed on the floor. Want to know the truth? I freaked out. I yelled and demanded to know whodunit. And then, much to my surprise, a little voice said “Sorry Ma, it was an accident.” And I smiled and thought smug thoughts about what a swell job we’re doing raising honest kids who take responsibility for their actions. And then Sunday morning happened. This time I was actually scrambling a dozen eggs (yes, we buy a LOT of eggs!) when I heard a howl from above. I ran upstairs to discover one sad little boy whose WaWa (our endearing term for a lovely blanket), pillow, bed and wall had been slathered in A&D Ointment. Are you familiar with A&D Ointment? It has a distinctly medicinal scent and the consistency of Vaseline. And it was everywhere. And I was pissed. So I yelled again. I really yelled. “WHO DID THIS? !” I shrieked. And four sets of unblinking eyes looked back at me in defiance, each seeming to say, “Not me.” “You’ll never know.” Or “you’d like to know, wouldn’t you?” They never fessed up. So much for raising honest kids who take responsibility for their actions! What to do? I decided to tell them the truth. To remind them how proud I’d been the day before when a guilty little fella fessed up. And how disappointed I was that they didn’t. I told them that I make mistakes. Lots of them. Like yelling at them like a crazy woman. I explained that nothing is more important than the truth. I believe this. And I hope my actions will teach them to believe it too. So that one day, when our worries are larger than broken eggs or “ointment art”, they will confide in me. Until then, I will try to yell less and just be grateful that everyone still wants to eat eggs together on the weekend! My name is Kerry Lyons, a.k.a. LyonsDenMom. I am amazed (and at times dismayed!) to have five little "Cubs", the oldest of which just turned six. My overly planned life took a turn toward chaos when I had naturally conceived, identical triplets in 2008. Now, more than ever, life is a complex juggling act that includes a full house, a full-time job and fulfilling my writing ambitions in all of my "spare" time. I hope you enjoy reading about life in the LyonsDen! Liam entered the world in November 2004, followed by Ciara in October of 2006. In 2008, we decided to go for #3... and, much to our surprise, got three more! The odds of identical triplets are about 1 in a 100 million so, we pretty much won the baby lottery when Kevin, Declan and Cormac were born at 36 weeks, each weighing between 5 and 6 pounds. Yes, that does mean I had over 17 lbs. of baby inside me and yes, it was extremely uncomfortable and unattractive! I am in Circle of Moms Top 25 Moms of Multiples – 2012!